The After School Activities and Athletics programs offer opportunities for students to discover and trust themselves and gain the confidence necessary to play and work cooperatively and competitively with their peers. Physical activity is essential for normal, healthy growth and development as well as providing decision making skills necessary to maintain a “Fit for Life” attitude. Concordian students take part in at least one after-school activity per semester. 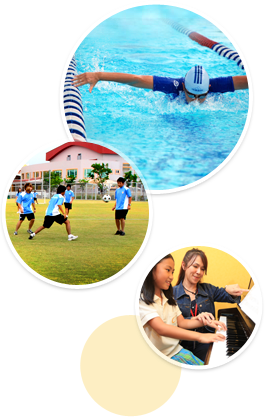 The school offers an extensive range of activities such as ballet, basketball, Chinese calligraphy, choir, drama, golf, soccer, swimming, tennis, pottery, piano, and violin. The Concordian Dragons proudly represent the school at interscholastic events. Our sports program allows students to interact across grade levels, fostering a sense of community and developing good sportsmanship qualities. We know that every student will rise to the many challenges that we offer. The IB Learner Profile emphasizes the importance of intellectual, physical and emotional balance to achieve personal well-being (Balanced) and the independence of spirit to explore new interests (Risk-takers). We are excited to help students in their journey of personal and academic growth.